April 1, 2005John F. Kennedy Space Center Americas gateway to the universe Spaceport Newshttp://www.nasa.gov/centers/kennedy/news/snews/spnews_toc.html Vol. 44, No. 7 Explore. Discover. Understand.By Kay Grinter Reference LibrarianVisitors to Kennedy Space Center may be surprised to find that the skyline has changed at the Press Site, located across from the Vehicle Assembly Building. Two longtime structures at the Press Site, the ABC Television Networks skybox and the media grandstand, have been removed. Several other temporary structures are being replaced with permanent facilities. One of the victims of the 2004 hurricane season included the roof of the NASA Newsroom, a permanent structure at the Press Site completed in December 1995. The damage occurredKSC News Center skyline receives makeoverwhen part of the grandstands awning flew off and impacted the roof of the newsroom. As a result, a major effort began to eliminate potential sources of debris that could cause further damage to permanent KSC facilities in future storms by replacing temporary buildings with permanent ones. The Press Site clean-up is but one part of the hurricane repairs funded by a $125.5 million emergency supplemental authorization KSC received in November 2004. This effort is being led by Mike Sumner, deputy director of Spaceport Services and program manager for the supplemental authorization. External Relations made my (See SKYLINE, Page 6)THE NEWS CENTER media grandstand, built in 1967, had a seating capacity of 350. A total of 130 launches were viewed by the press from the grandstand, beginning with Apollo 4.The orbiter Discovery recently rolled into the Vehicle Assembly Building, marking a major milestone in the march to Return to Flight. Inside the VAB, Discovery was mated to the External Tank/Solid Rocket Booster assembly for mission STS-114. Discovery is scheduled to roll out to Launch Pad 39B next week. The launch window for mission STS-114 is May 15 to June 3.Discovery rollover to VAB symbolizes milestoneSPACE SHUTTLE Discovery enters the Vehicle Assembly Building early morning March 29. DISCOVERY IN the transfer aisle of the VAB. SPACEPORT NEWS April 1, 2005 Page 2 Awards The Kennedy UpdateJim Kennedy Center DirectorHi, everyone! I hope youre having a great April Fools Day. If someone pulls a fast one on you, have some fun with it; we all need to take the time for a good laugh. It is nice to finally turn the page on winter with springs arrival. More importantly, it signals we are only about 45 days away from the opening of our Return to Flight launch window. Im really starting to get excited. Speaking of excitement, it was quite a week for our Space Shuttle Program with the Discoverys rollover from OPF #3 to the VAB. This culminates more than two years of work preparing the orbiter with all the necessary Columbia Accident Investigation Board upgrades (as well as the Raising The Bar initiatives we imposed upon ourselves) to return Discovery safely to flight. It was exciting to see this mighty ship start the process for launch. Thanks to everyone who came out to cheer her on; it was truly a significant emotional event in my life and in the lives of our Shuttle employees. Congrats to Denny Kross, Mike Wetmore, Admiral Pickavance and the entire Shuttle team on a well deserved, Super job! The hits keep coming next week, as well. At press time, Discovery (after mating with its External Tank and Solid Rocket Boosters) will rollout to Pad 39B early next week. Shell stay perched there until she launches sometime during our launch window of May 15 June 3. We will carry portions of the rollout live on NASA TV. Im sure youll hear all about it in the news, as this will not only be a great day for NASA and KSC, but a great day for America. Well get to celebrate all these success at the KSC AllAmerican Picnic, which is now only eight days away. Tickets are currently on sale and I sincerely hope you and your family and loved ones come out for the day. Last year, more than 8,000 people attended and we had a tremendous time. There are plenty of childrens games, activities, food, drinks and a variety of music to keep you entertained all day. A highlight is that we have astronauts coming wholl sign autographs. People can also take a windshield tour of the launch pads. I truly look forward to meeting your families or other special people in your lives. See you at KARS Park April 9! I see several of you took the early retirement or early out offer and today is your final day with NASA. For many, this comes after years of faithful service to this Agency and our beloved KSC. Let me take a moment to say thanks for all you have done in service to NASA and this nation. I personally want to thank you for the service and support youve given me during my tenure as director. You all will be missed but not forgotten, and I hope you will come and visit often. May God bless you all! Finally, I appreciate those of you who came out to listen to Congressman Dave Weldons words on March 24. As time rolls on, I promise to do my level best to keep you updated on the happenings in Washington relating to the Vision for Space Exploration and KSC. Have a great week and see you at the picnic! "Let me take a moment to say thanks for all you have done in service to NASA and this nation. "Senior management from NASA, the Air Force and other areas of the spaceport traveled to Tallahassee March 22 to discuss NASAs future with Florida Gov. Jeb Bush and the legislature during Florida Space Day. An annual event for elected officials that spotlights spacerelated programs, this years event provided a forum for discussing the next steps to achieve the Nations space exploration vision, as well shortterm milestones in the U.S. space program, including the safe return to flight of the Space Shuttle and continuing International Space Station assembly missions later this year. During the daylong event, representatives from Floridas $4.5 billion space industry briefed Governor Bush, Lt. Governor Toni Jennings and Florida legislative leaders at the state capitol. Space-focused hearings with officials alsoSpaceport officials address legislators at Florida Space DayCENTER DIRECTOR Jim Kennedy (left) discusses NASA's future with Florida Gov. Jeb Bush at Florida Space Day, along with Capt. Winston Scott, executive director of the Florida Space Authority (second from right), and Martin McLellan, vice president of ground operations at SPACEHAB. ABOVE, KSC Director Jim Kennedy addresses members of the legislature during Florida Space Daydiscussed how the space exploration vision will present new opportunities across Florida. There are more than 180 space-related businesses in 46 counties employing 23,000 Floridians. For the sixth year in a row, officials from NASA, the Air Force, Florida Space Authority, ASRC Aerospace, Boeing, Delaware North Park Services, Jacobs Sverdrup, Lockheed Martin, SPACEHAB, Space Gateway Support, United Space Alliance and Wyle Labs participated in the event. Page 5 SPACEPORT NEWS April 1, 2005 THE SECOND redesigned External Tank (ET-121) moves slowly on the road from the Turn Basin to the Vehicle Assembly Building. The tank recently arrived at the Turn Basin aboard a barge after its 900-mile journey at sea from the Michoud Assembly Facility in New Orleans. In addition to the Return to Flight modifications, this tank has been outfitted with temperature sensors and accelerometers, used to measure vibration. These sensors will gather information about how the tank performs during flight.Second redesigned External Tank arrives u pply module ready for ISS visitAT LEFT, in the Space Station Processing Facility, the Rack Insertion Device moves the Human Research Facility-2 science rack toward Raffaello (at left). ABOVE, technicians begin moving resupply stowage bags into the Italian-built Raffaello. The bags will be placed in containers known as resupply stowage racks. AT RIGHT, technicians in the Space Station Processing Facility place resupply stowage bags into containers known as resupply stowage racks inside Raffaello. 4 crew conduct a payload the Space Station Processing s amples are mission t ) and Soichi Noguchi (right), ce Exploration Agency. Logistics Module Raffaello, g engineer, talks to mission ) and Soichi Noguchi (right). 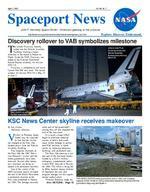 Page 8 SPACEPORT NEWS April 1, 2005 John F. Kennedy Space Center Managing editor. . . . . . . . . . . . . . . . . . . Bruce Buckingham Editor. . . . . . . . . . . . . . . . . . . . . . . . . Jeff Stuckey Copy editor . . . . . . . . . . . . . . . . . . . Corey Schubert Editorial support provided by InDyne, Inc. Writers Group. NASA at KSC is located on the Internet at http://www.nasa.gov/centers/kennedy USGPO: 733-049/60078Spaceport News Spaceport News is an official publication of the Kennedy Space Center and is published on alternate Fridays by External Relations in the interest of KSC civil service and contractor employees. Contributions are welcome and should be submitted two weeks before publication to the Media Services Branch, IDI-011. E-mail submissions can be sent to Jeffery.Stuckey@ksc.nasa.govTICKETS ARE on sale for the 2005 KSC All American Picnic, including a discount offer until April 6. Kicking off the ticket sale are, from left, Dr. Woodrow Whitlow, deputy director; Bob Gerron, picnic publicity cochairman; Jim Kennedy, Center director; Phil Bennardo, picnic chairman; and Jim Hattaway, associate director.This years picnic will have a Return To Flight theme and many special events. The day will start with a parade and RTF Rally, which will include several cheerleading squads showing the RTF spirit throughout the day. Stop by the RTF tent highlighting the excellent work done by the KSC team. Attendees can take advantage of the Pad B drive-by for a look at Space Shuttle Discovery. Tickets will be offered at a discount if purchased before April 6. The cost is $5 for adults and $3.50 for children ages 3 through 12, and ages 2 and under are free. Although children 2 and younger are free, tickets must still be obtained for them. Everyone entering the park is required to obtain a ticket. If purchased after the discount period, the regular cost is $7 for adults and $5 for children ages 3 though 12. The admission fee includes the childrens carnival and rides, childrens games, fishing tournament for kids, entertainment, the wild cats, sport games,Return to Flight is theme of 2005 All American Picnicpony rides, K-9 show, displays, a car show, and lunch and drinks; however, ethnic food booths will be offering additional selections for a small fee. Tickets will be available at the following locations: The sundry store of the Headquarters Building, Operations and Checkout Building, Space Station Processing Facility and Operations Support Building; Hangar I Annex, room 204 (see Peggy Parrish); KARS Country Store; and NSLD, cube 659 (see Debbie Doyle). Some of the bands scheduled to perform include Saturn 5 (50s-70s rock and roll), Proximity Effect (70s-90s rock and roll), Roughouse (classic rock and blues) and RockIt (classic rock, alternative and funk). A variety of family sports will be offered, including a closestto-the-pin contest, bingo, a 3legged race, egg toss, pie eating, a fishing tournament and much more. Children will enjoy a carousel, pony rides, two jumping tents, free cotton candy, popcorn, snow cones and face painting. In addition, groups such as the KSC Barracudas Scuba Diving Club, Spaceport Rocketry Association, Military Vehicle Preservation Association and others will offer information about their activities. Visit www.kscpicnic.ksc.nasa.gov for information.The National Space Club Florida Committee will present the Dr. Kurt H. Debus Award honoring significant contributions to the advancement, awareness and improvement of aerospace in Florida. This award will be presented at the 16th annual Debus Award Banquet on April 16 at the Kurt H. Debus Center at the Kennedy Space Center Visitor Complex. KSC Director Jim Kennedy will be the keynote speaker. Cost is $75 for members or $85 for non-members and corporate tables of 10 cost $800. Attire is black-tie optional. Reservations must be received no later than April 8. Make reservations with Sandy Andre at sander@cfl.rr.com or 867-5194. The winners of the 2003 and 2004 Debus Awards were Adrian Laffitte with Lockheed Martin and John Tip Talone with NASA.Debus Award Banquet to honor aerospace achieversThe annual KSC Environmental and Energy Awareness Week activities will take place April 20-21 with the theme Progress and Challenges since the initial Earth Day Celebration in 1970. There will be more than 35Environmental and Energy Awareness Week celebrates progressexhibitors, six tours and various alternative-fueled vehicles on display. The event kicks off with a breakfast April 20 at 8:30 a.m. in the Space Station Processing Facility Cafeteria (tickets cost $4), followed by the opening of an exhibition tent in the Operations and Checkout Building parking lot from 11 a.m. to 2 p.m. On April 21, an exhibit area will be set up in the Vehicle Assembly Building parking lot E. This is an excellent time to learn about our successes and what you can do to continue to foster environmental stewardship, energy conservation and continual improvement through increased awareness, Center Director Jim Kennedy said. Visit http:// eeaw.ksc.nasa.gov for details.